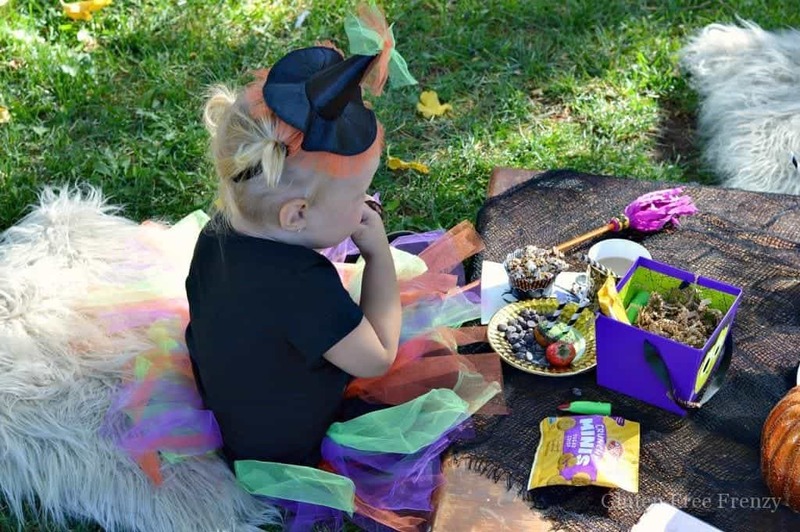 This little witches tea party is so festive and fun. 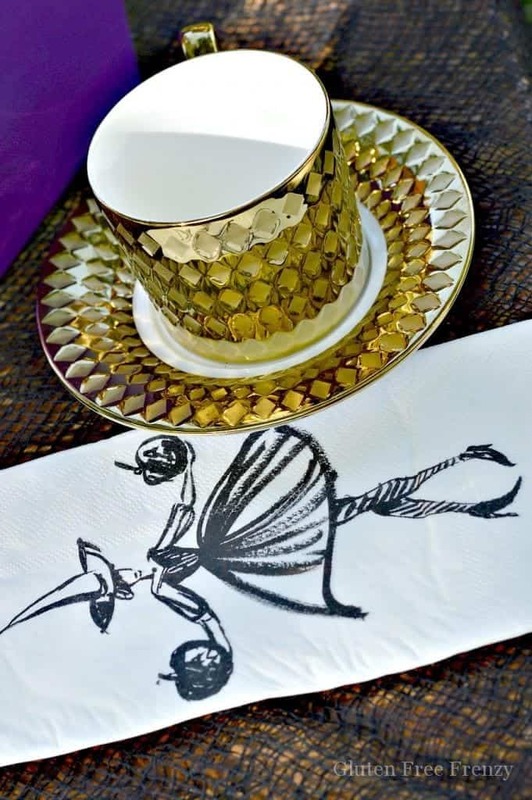 It is full of little pops of witchy whimsy from food to decor. 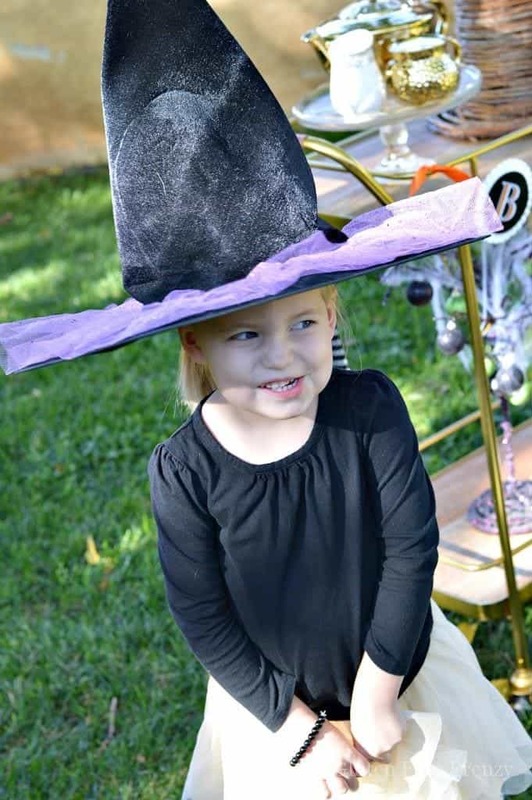 With bursts of gold, purple and orange, this witches tea party is sure to bring Halloween magic to the eyes of all your little guests. 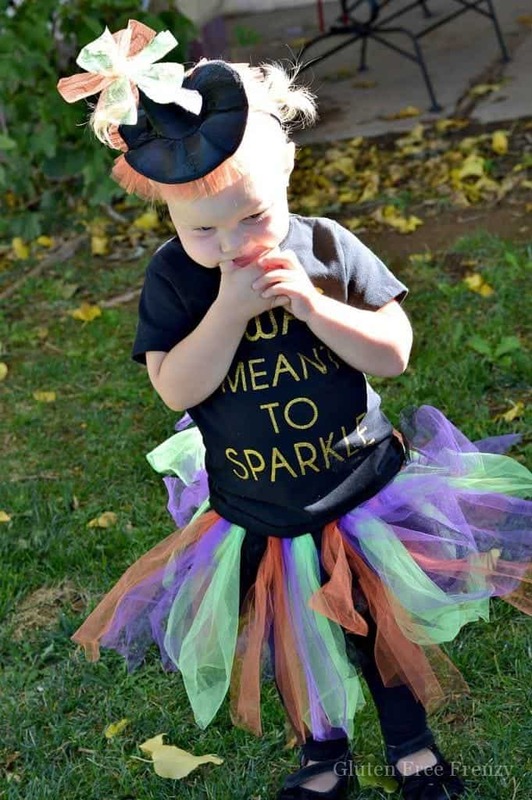 Ever since having a little girl, I have wanted to throw cute parties like this one. A tea party was at the top of my list. 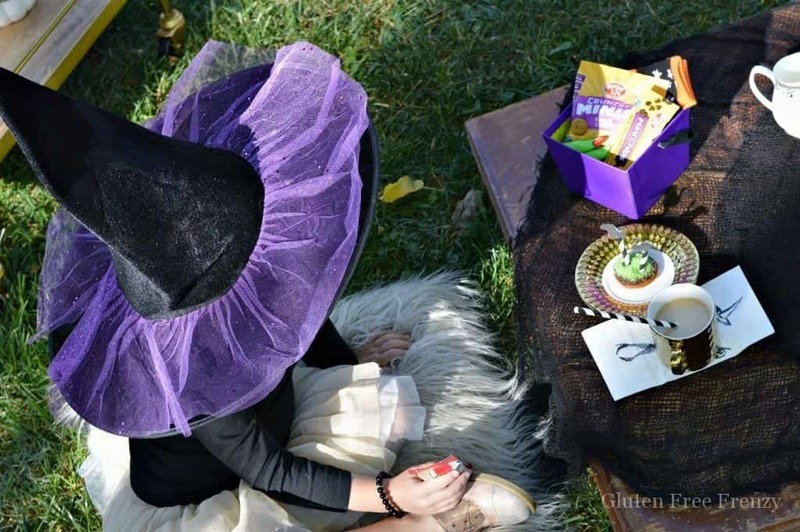 Since I also love Halloween, it seemed to be a great idea to host a little witches tea party. Complete with tea cups the perfect size for our tiny guests, little favor boxes and lots of bite sized treats. Since my little lady’s friends are all pint sized, I wanted to do a trendy floor table that made it easy for them to dine at. 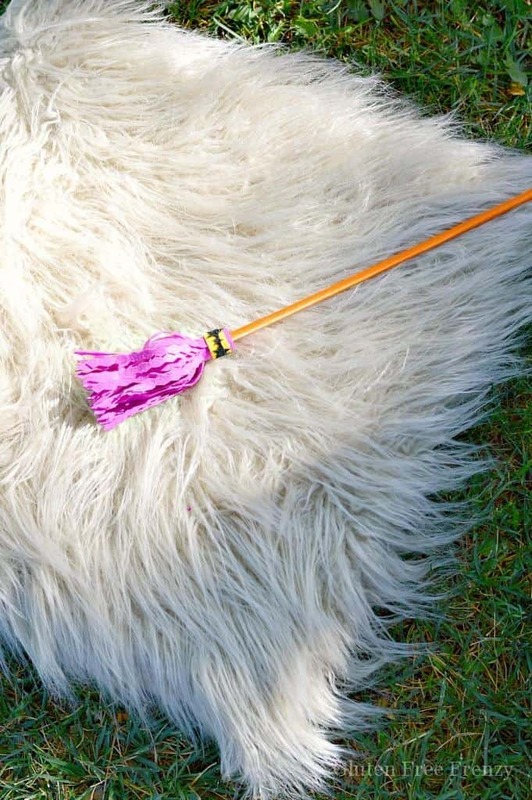 Individual fur cushions made for fluffy and comfortable seats. I wanted the magic to engulf each guest immediately upon arrival. 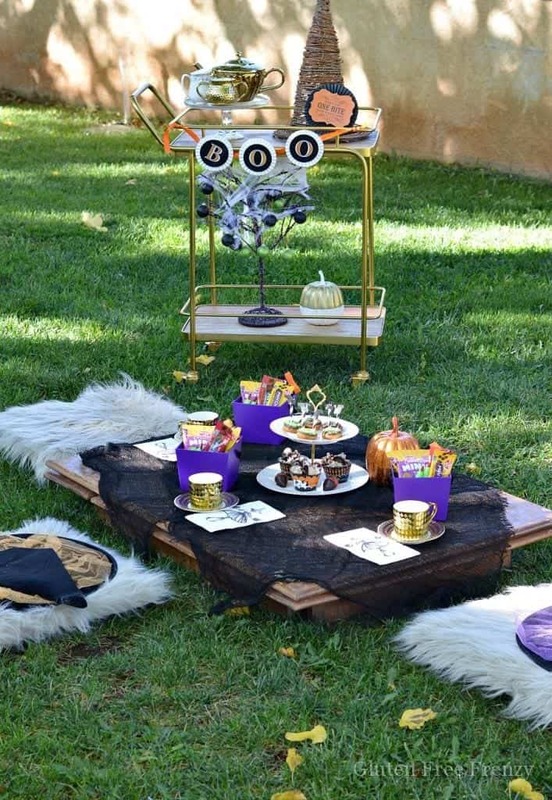 To create this whimsical set up, I placed colorful witches hats on each seat. Next, were the bright purple treat filled boxes. 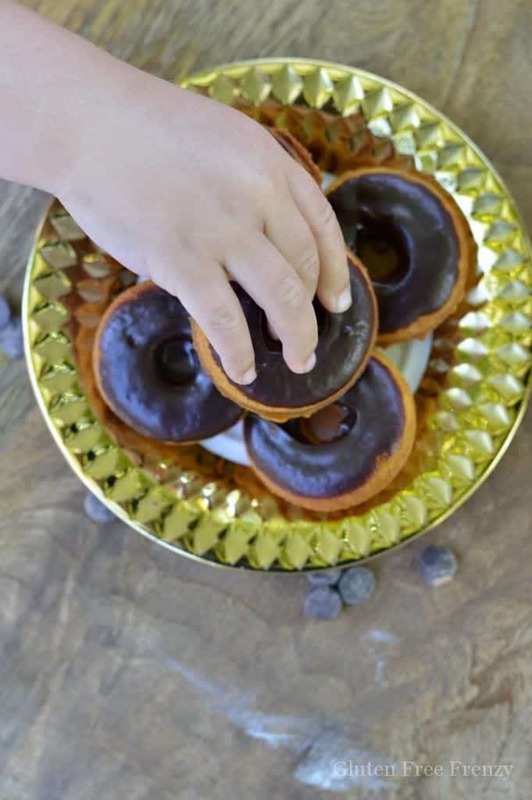 I decided to fill them to the brim with Enjoy Life Foods goodies including their mini cookies perfect for tiny hands. 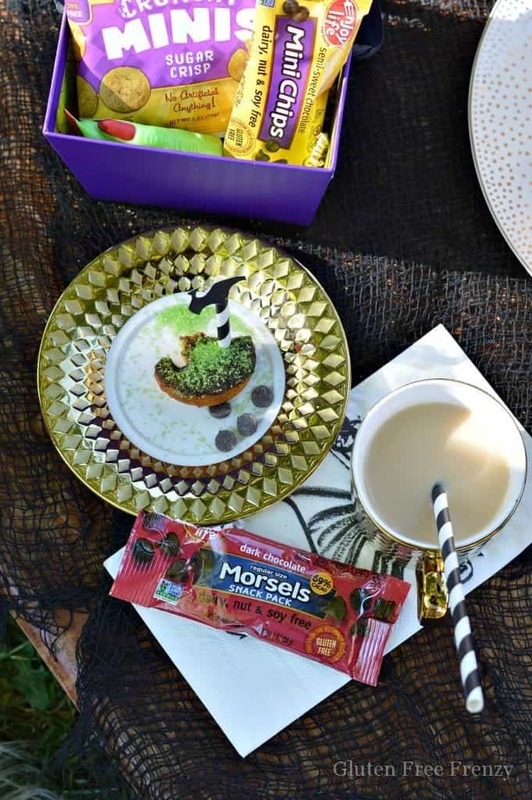 The NEW individual chocolate morsel snack packs and mini chips as seemed like the perfect addition. 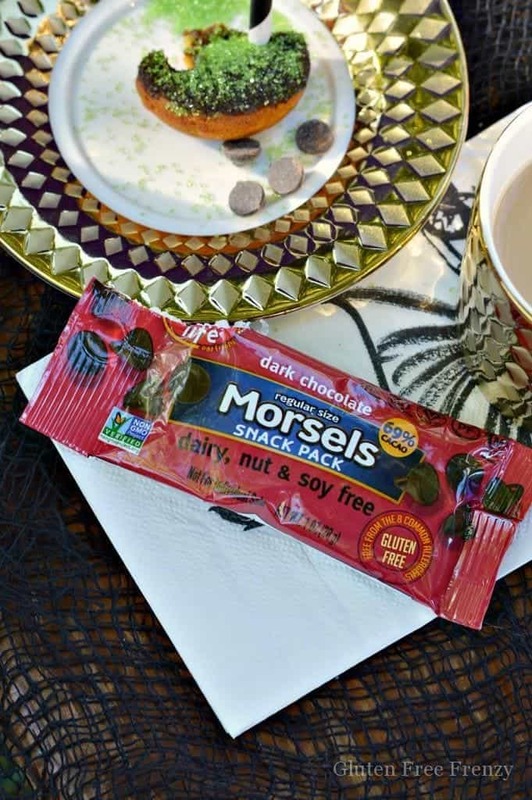 I love that they are perfect size for on-the-go snacking. I also put in some plastic witches fingers because it was just too fitting. 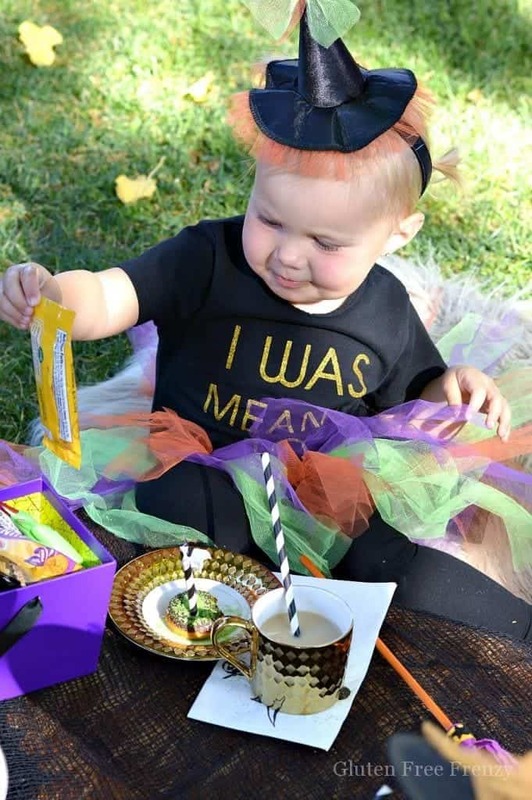 Both the hats and treat boxes doubled as party favors. 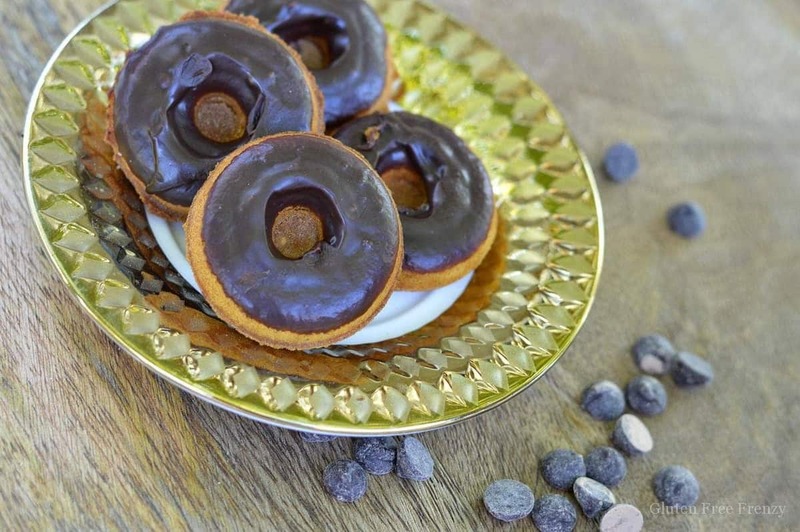 Of course, what is a tea party without dainty little treats and tea? 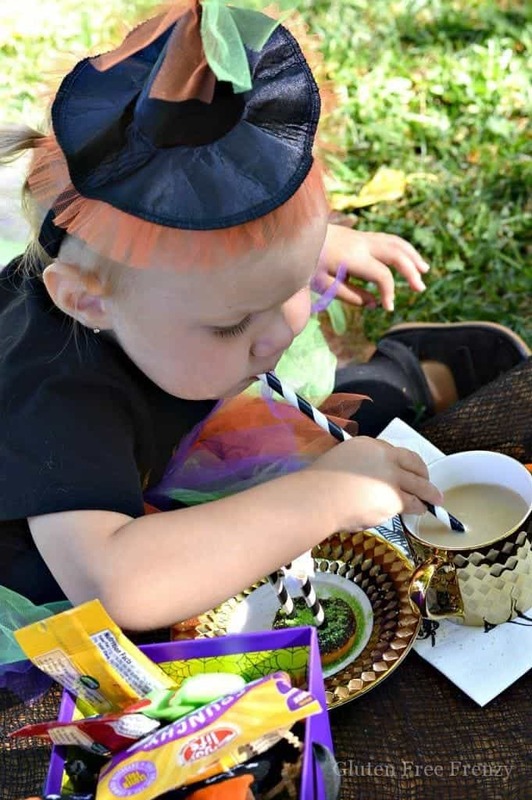 I decided on an herbal chocolate tea for our cute little witches to enjoy. We also drizzled popcorn in Enjoy Life Foods dairy-free chocolate combined with coconut milk like here in our recipe, for a sweet and salty treat. 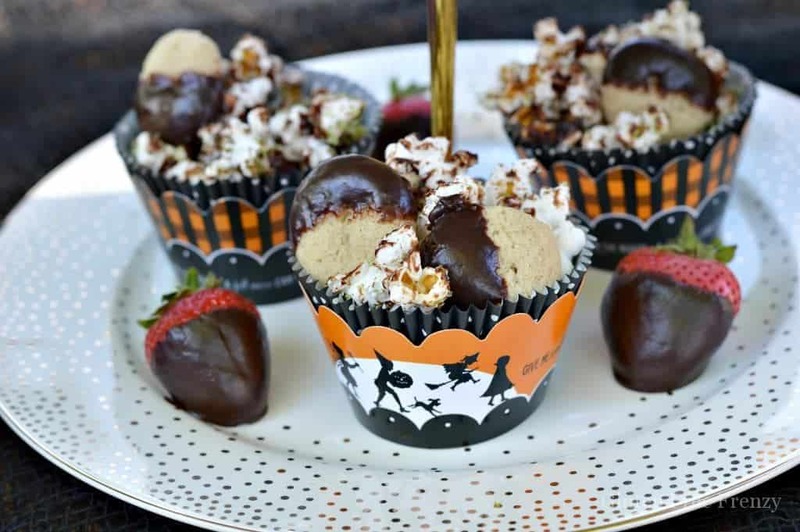 Dipping the mini cookies into the chocolate added another nice touch to our popcorn cups. 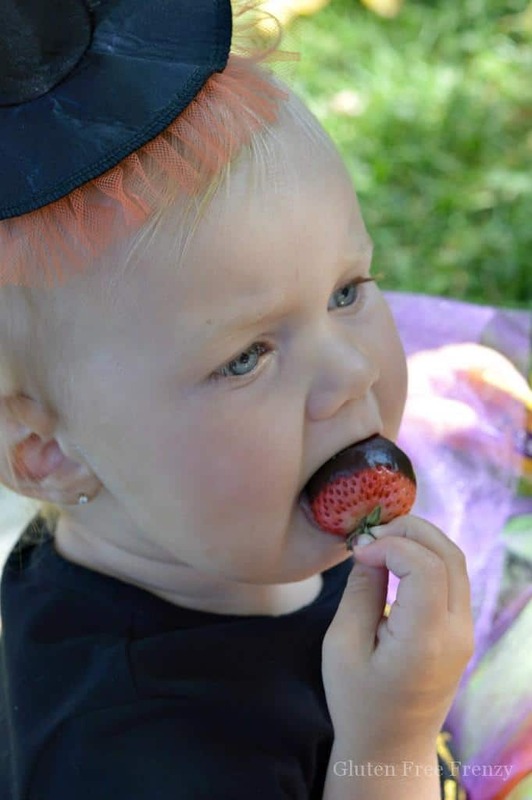 Since all tea parties need some fruit, even if they are in the fall; I decided to do some mini dairy-free chocolate dipped strawberries. 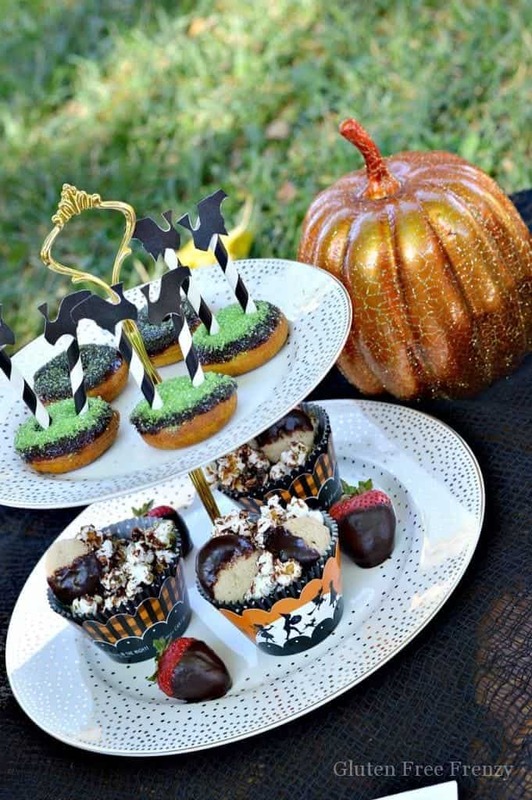 I couldn’t resist doing a witch themed dessert so I decided to make our dairy-free chocolate dipped pumpkin spice donuts into melted witch donuts! 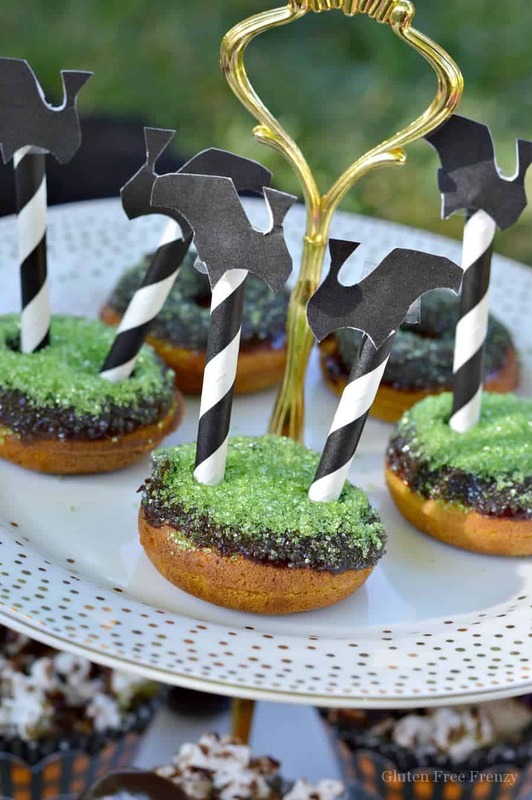 By simply topping each with bright green sprinkles and some black and white striped straws cut down, we made the body and legs. 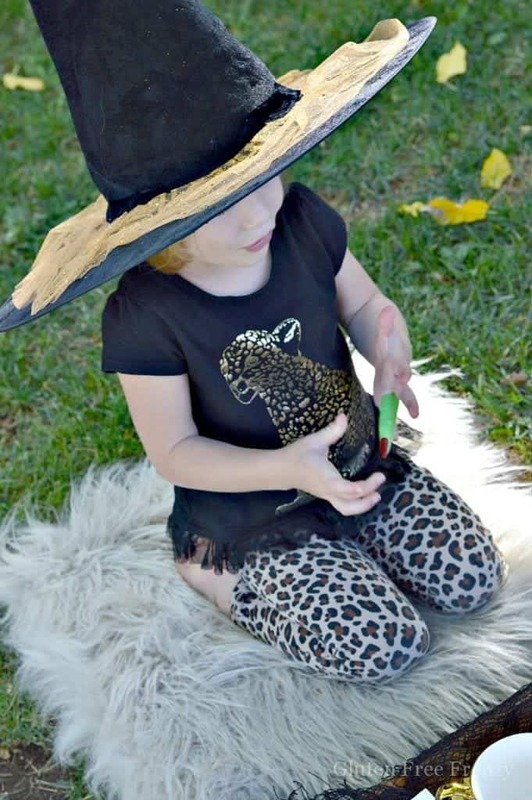 I then added these darling printable paper witches shoes from Pen N’ Paper Flowers to the ends of the straws for a super authentic look. The girls loved them! 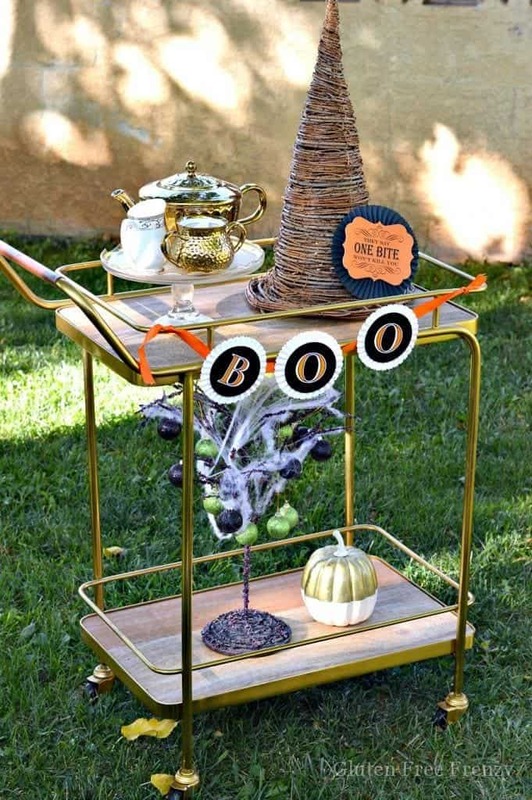 Since we were hosting a tea party, it made sense to have a styled bar cart. 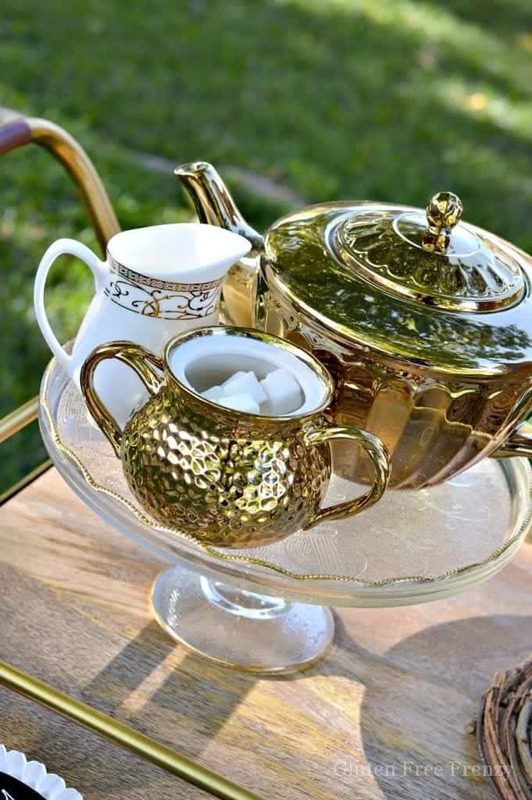 I found this perfect gold tea set that I couldn’t pass up. I wanted to style the tea pot, milk saucer and sugar dish to be displayed beautifully for all the guests. Can you believe that on the same shopping trip to HomeGoods, I also found this wicker witch hat? 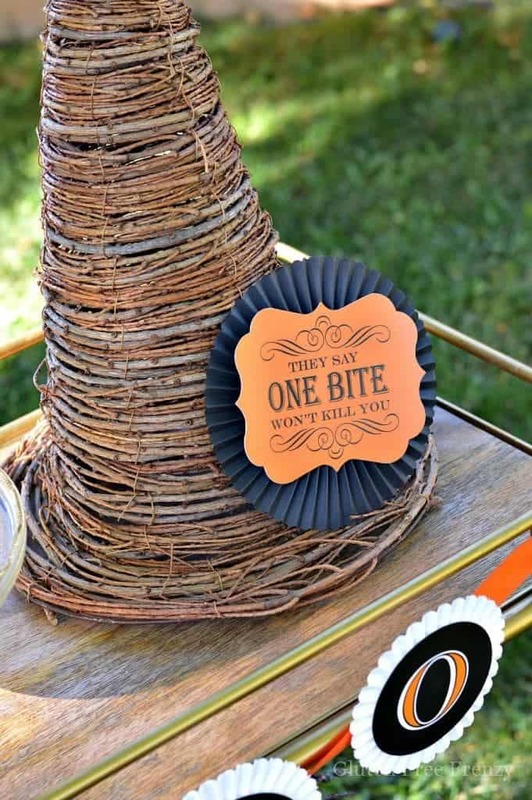 I was so excited to find such a perfect decoration for our little witches tea party! 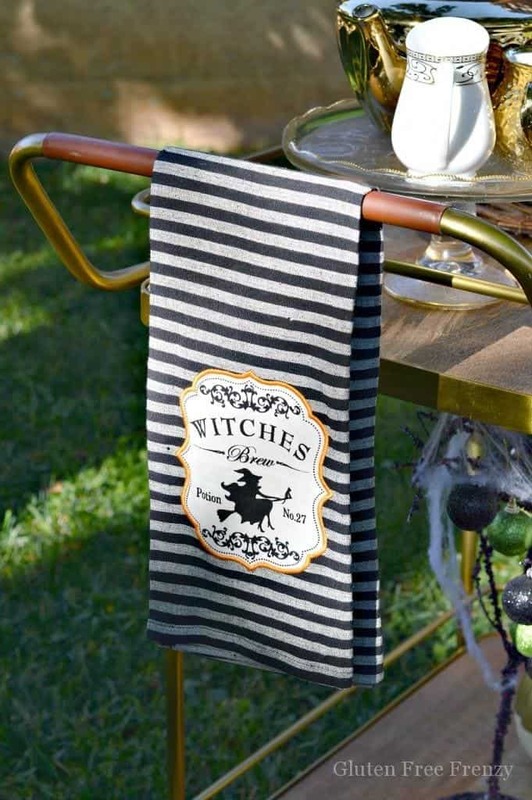 The witches brew tea towel draped perfectly over the handle. 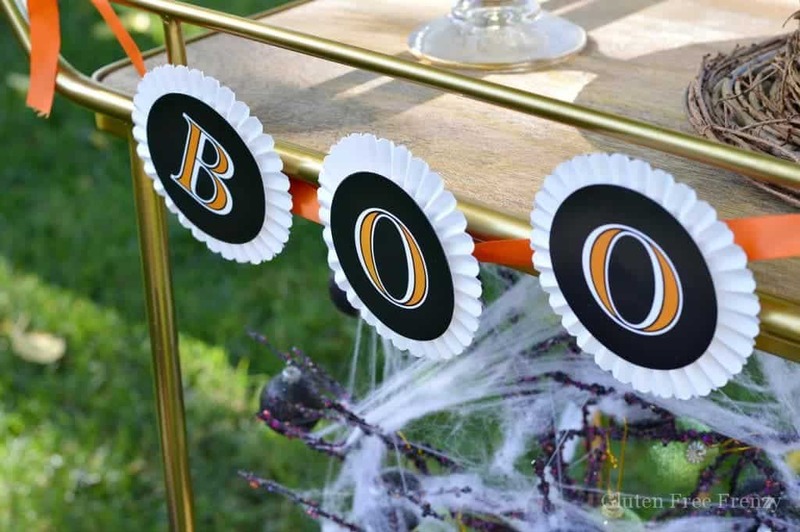 The BOO banner and rosette buffet sign from Loralee Lewis’ Halloween collection couldn’t have been more perfect with our decor. 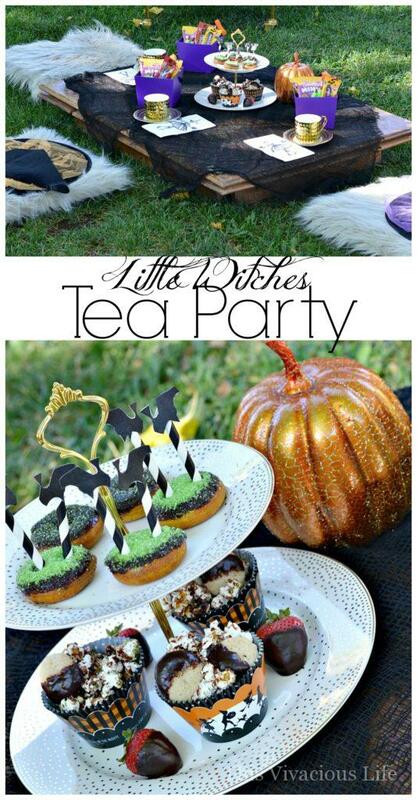 Adding some pumpkins here and there made this little witches tea party that much more festive. 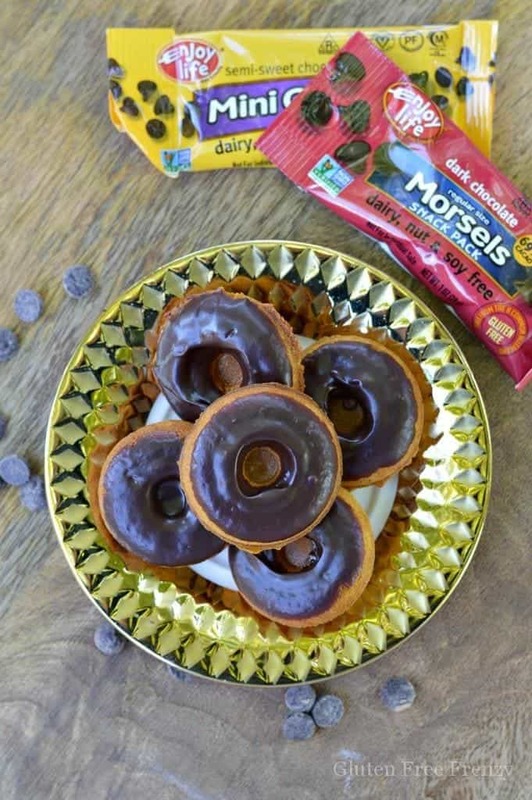 Even if you don’t host a little witches tea party of your own, be sure to check out our dairy-free chocolate dipped pumpkin spice donuts recipe HERE. 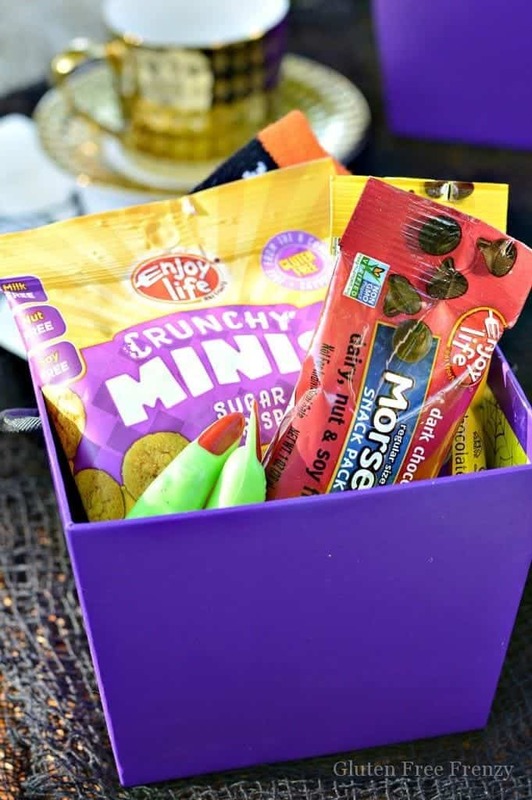 Also, head over to visit our friends at Enjoy Life Foods to see all the tasty treats they have that are perfect for serving up this Halloween! *This is a sponsored post by Enjoy Life Foods. I was provided with monetary compensation and products. Opinions are all my own and truly reflective of how we feel about these products. We love Enjoy Life Foods brand and use their products often. So darling!!! 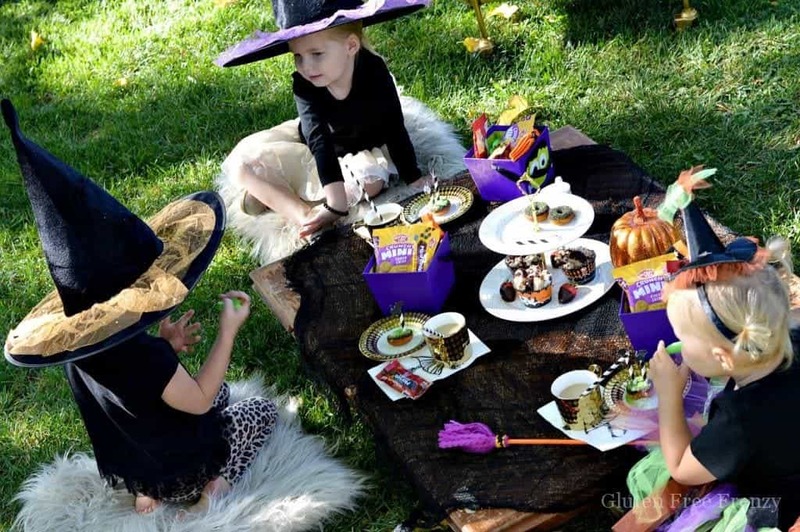 A witches tea party is such a cute idea. Love all the fun accents and touches. Aw, thanks mom! So glad you like it because I KNOW you have good taste. 😉 Love you!